E-commerce has opened up the doors for all kinds of business ideas and entrepreneurial pursuits. It provides companies with virtually endless opportunities to reach customers, both domestically and internationally. The online retail market has continued to grow year-over-year, and is increasing in popularity worldwide. Artificial intelligence (AI) technology is also growing and becoming more common in the business world, so it's no surprise that it's making waves in e-commerce as well. However, AI is not just another tool that offers some cool features for a website. The technology is turning online retail on its head by totally transforming strategies and allowing business owners to be truly data driven. The user experience (UX) of your website correlates directly to conversions — many studies have proven this. Businesses have been investing billions into UX improvements, such as mobile optimization and better platform designs. Smarter e-commerce platforms that use AI and machine learning predictions to create a better experience for customers are helping to address these UX issues. One clear benefit of AI integration in e-commerce platforms is personalization. In a recent Salesforce report, businesses that used AI to provide personalized recommendations to their customers reported 24 percent more conversions and 26 percent higher revenues. Furthermore, customers were 4.5 times more likely to convert when e-commerce sites displayed custom product suggestions based on their previous behavior. AI makes personalization possible on a large scale because it can transform loads of consumer behavior data into actionable strategies. 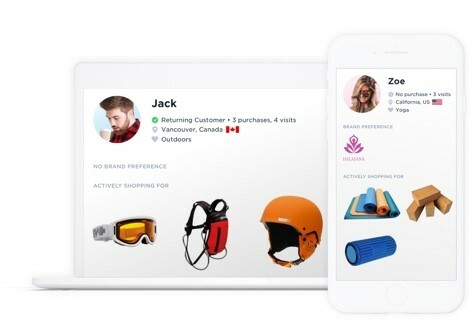 E-commerce tools like Nosto store customer information through cookies, and use AI to create more personalized pages with products and content displayed to align with the customer’s preferences based on past purchases and browsing behavior. Nosto segments audiences based on their behavior to create customized page layouts for an optimized experience aimed to increase conversions. This directly supports a better overall UX and creates the customized experience that consumers expect from online retailers. Data is key to smarter decision making, but analytical reports have only been able to show businesses what has worked in the past. Through AI and machine learning, e-commerce companies can now predict future trends and make smart decisions based on those forecasts. This capability can be extremely helpful for things like inventory management. Predictive technology can spot upward (or downward) trends in the market and alert you ahead of time so that you can order a more precise amount of inventory for the next round of purchases. Of course, e-commerce businesses will only be able to fully take advantage of AI if they have access to large amounts of data and the appropriate manpower to process it. 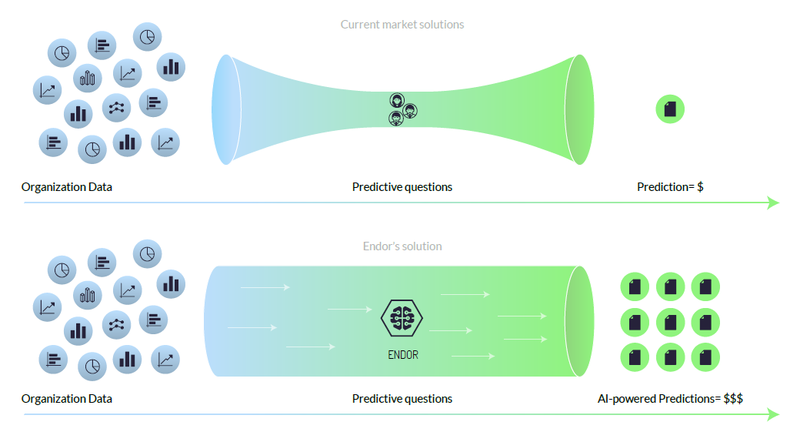 Endor’s predictive AI solution is helping to make this a reality by introducing a machine learning engine that's effective and nimble enough to service businesses of all shapes and sizes, while cutting down human labor expenses and knocking down price per prediction. Endor’s platform can “digest” a raw data set, then answer questions related to the data presented, such as “Which stores are likely to sell 25 percent of brand X in the next quarter?” or “Which audience segment will be buying X product in the next two months?” all in a matter of hours. This means that businesses don’t have to hire an entire team of data scientists to get the same job done, instead relying on the Endor AI solution to reach the same results. The use of chatbots has exploded over the past few years, and consumers are beginning to get more comfortable with using them as a first point of contact with a business. 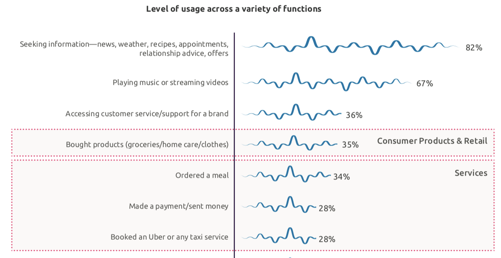 Drift conducted a study on consumers’ feelings regarding AI-powered chat, and found that while human interaction is still the preferred method for customer service, the majority of people are starting to see how using a chatbot could benefit them for specific circumstances, such as getting an immediate answer or resolving a complaint. Using AI chatbots can be a huge cost savings for online retailers as well. TechStyle Fashion Group runs several major e-commerce sites, including JustFab and Fabletics. The company recently integrated an AI self-service solution omni-bot to handle customer service issues. Overall, this chatbot significantly reduced the number of calls to its contact center, saving the business over $1 million in 2017. Furthermore, customer satisfaction rates were maintained and the time it took to resolve issues was reduced. Another way that AI is turning the online retail sector on its head is by opening up an entirely new avenue for consumers to transact. The use of voice-powered AI shopping assistants like Amazon’s Alexa and Google Home have become increasingly popular. Users can order items by simply issuing a command to add to their cart. According to a study from Capgemini, 24 percent of consumers now say they would rather use a voice assistant over a website to make a purchase. Additionally, 35 percent use them to buy their most frequently purchased items like groceries, home-care products, and apparel. As AI-powered voice shopping continues to grow, online retailers will need to optimize their sites and product pages for this type of purchasing. Brands will need to focus on SEO strategies since voice assistants rely heavily on exact keyword phrase matches. E-commerce marketers will also need to think about how natural language search queries work, as well as create content that accommodates voice-powered purchases. There's little doubt that AI is going to change the way consumers shop and the way online retailers operate. Already, this technology has revolutionized the way brands interact with customers by allowing them to offer better experiences through data-driven tools like chatbots and personalized options. As AI technology becomes more sophisticated, it's also going to become even more accessible for even the smallest of online retailers. We can only expect to see even more changes in the near future. Manish Dudharejia is the president and co-founder of E2M Solutions Inc, a digital agency that specializes in website design and development and e-commerce SEO.